Sneezing is a natural reflex of the body to overcome cold or allergen factors. When you have a cold, have tissues on hand all the time. The best way to prevent the spread of the germs when you sneeze is to cover your mouth and nose with a paper tissue. If the sneeze is loud and repeatedly than quickly excuse yourself, leave the room and head to the restroom. Return after you blew your nose and washed your hands. Sometimes, a sneeze can get you by surprise and unprepared with a napkin or handkerchief on hand. 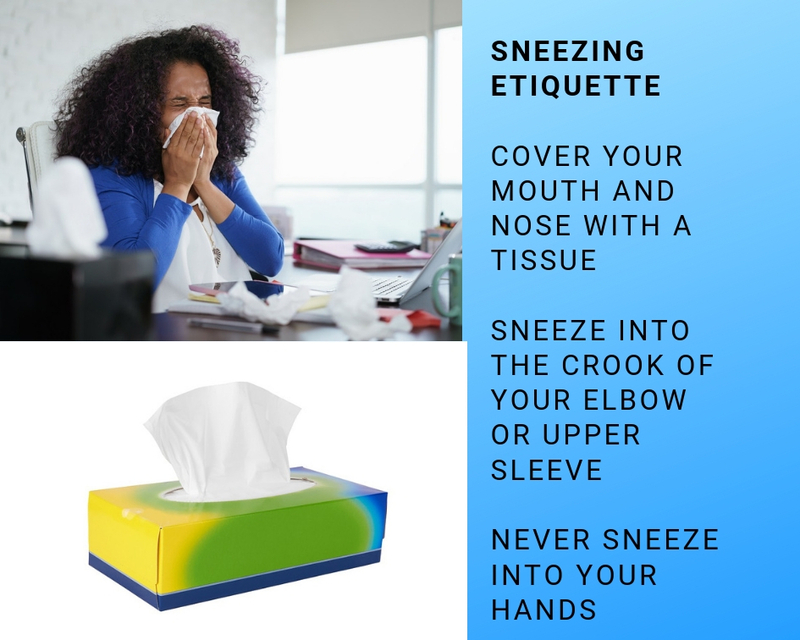 In this situation sneeze into the crook of your elbow or upper sleeve to minimize the effect and say “excuse me” afterward. Never sneeze into your hands. Maybe, later on, you will have to hold a paper and pass it on to somebody else or make a handshake at the end of the meeting. If somebody hands you a tissue accepted and thanked that person after the sneezing has stopped. 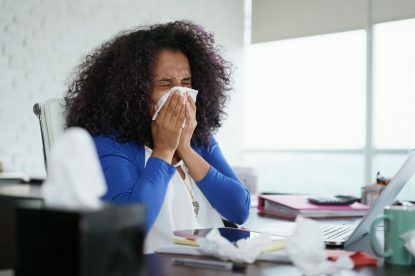 Don’t try to talk while you feel that a sneeze or a cough will occur; you may end up sneezing in the person’s face who wants to save you from this embarrassing situation. Always discard the used tissues in the nearest basket or discretely put it in your pocket and throw it away as soon as you see a trash can. Do not hand back the used tissue or the handkerchief to the person who gave it to you. Show your appreciation gracefully with a “Thank you” and move on. It is proper etiquette to say “God bless you” or “Bless you” if someone near you sneezes. But do not repeat the blessing as many time as that person sneezes. One time is considered a proper manner but repeating may offend that person who is already in an awkward position. Remember to be always courteous and show consideration and understanding to people around you. Sometimes a simple gesture can have a more significant impact than a dozen words.